IBPS RRB Recruitment 2018 Notification had updated for 10, 190 jobs of CWE RRB Office Assistant, Officer Scale-I [email protected] Check the full details of IBPS RRB 2018 Notification at our page. IBPS RRB PO (Officer Scale-I) and Clerk (Office Assistant) Application form has started on 8th June 2018 and will be ended on 2nd July 2018. This IBPS RRB prelims exam date is Officer Scale-I – 11, 12, 18 August 2018 and Office Assistant – 19, 25 August And 01 September 2018. IBPS RRB Notification 2018: Hello, to all Govt bank job seekers in India. Especially to them, who was always only trying for IBPS Recruitment notifications every year. Yeah! guys, this IBPS RRB PO, Clerk Notification we had brought now it’s only for bank hunters not for any others so, keep remember this, this isn’t a State Govt job and it is a Central Govt notification. 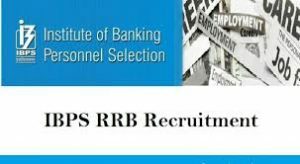 The Latest IBPS RRB Recruitment from Institute of Banking Personnel Selection is for 10190 Office Assistant, Officer Scale-I Posts. The IBPS has released Latest IBPS Vacancy notification for direct recruitment of offered jobs in 2018. Refer the more upcoming bank jobs of 2018 on our portal www.recruitmentinda.in. IBPS RRB PO& Office Assistant Recruitment update has issued at the primary portal @www.ibps.in. on 6th June 2018, as we knew many of the postulants prefers to search at the principal website of Institute of Banking Personnel Selection. But here also we were sharing the full information which is regarding of PayScale, Educational qualifications, age limits, application fee and other required details are suggested in this article. Basically, the applicants would make some mistakes while filling the essential details so, you should need to get aware some about of “how to enrolled in online to this notification”. The complete step by step procedure to apply IBPS Application Form is given in the below description. Latest Govt jobs were suggested on our page. Compulsorily required Graduation (Degree) along with computer knowledge certification from a recognized university or board to apply for these clerk jobs. Talking about the age relaxation, the profile matched person would have the age in between of 20 to 30 years of old, remember note exceeds more than 30 years. The Institute of Banking Personnel Selection will offer as per the job suitability payscale, no need to kept doubts about it. Below Office-Assistant and Officer Scale-I posts, IBPS RRB Salary details are given. Pay Scale of IBPS RRB Office Assistant : 7200-(400/3)-8400-(500/3)-9900-(600/4)-12300-(700/7)-17200-(1300/1)-18500-(800/1)-19300. Postulates should be taken as per the hiring rounds of IBPS. Usually, Unreserved applicants have 600 rs /- through online mode payment and for reserved applicants have 100 rs. /- have to pay. IBPS RRB Provisional Allotment January 2019. IBPS RRB 2018 Application Form: Let me ask you a question, are you currently looking or searching for any bank jobs in the span of 2018-19? then, no need to worry this IBPS RRB 2018 Notification is the best to you at present time. Because the IBPS was willing to direct recruitment the newcomers or freshers who were got certifications in Graduate Degree to this Office Assistant, Officer Scale-I which number is tentative. Coming to the notification topic, all postulates must be in between of 20 to 30 years of old, shouldn’t be more than 30 years. If any applicant applied without satisfying the criteria of IBPS RRB Recruitment, they are simply rejected by the IBPS Officials. After completing the online registration process in the Aug month 2018, catch the Exam Admit Cards of IBPS Exam. IBPS RRB Officer Scale-I, Office Assistant Registration Link has given in the below, you could check out them clearly as well as the examination dates of Prelims exam and Mains exam written test dates. Willing ones should check the IBPS RRB Recruitment Official Notification which was terminated by the board officials is given at the bottom of the page. We wish you all the best of luck, the Login portals of IBPS notification are opened and follow them in the below. Firstly, visit the legit website @www.ibps.in., search for main notification and click, enroll your full details. Up to in the 2nd July 2018, the web portal will be in hanging so, apply as fast as you could. One more, take a hard copy after completing the enrollment.